Perfect for adding equipment on top of your DSLR or for setting up flashes on a stand / tripod. I haven't uses it for flashes so I can't say much about the umbrella hole and so forth, but everything looks good with this gadget. Lightweight, solid construction, actually feels like aluminum. 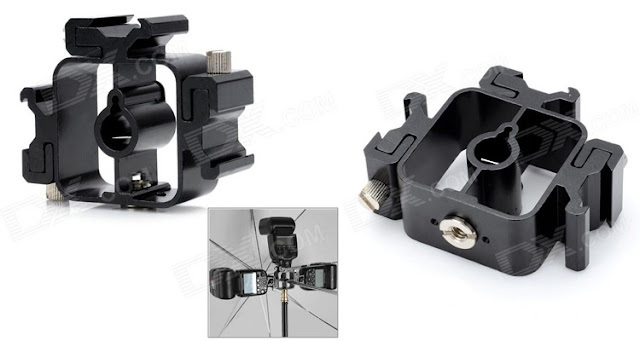 Perfect in combination with a hotshoe screw to mount both a LED and a mic on top of a DSLR. Good and easily operated screws. Comes with a 3/8" - 1/4" converter / adapter so it can be mounted on both sizes. Haven't found any so far. Technically it's not a hot shoe, but a cold shoe since it doesn't have any electrical connectors.